Fritters are quite a popular snack and are prepared using various recipes with different ingredients to create immense varieties. What if we told you there was a way to make vegan fritters that are just as delicious!! Here’s an easy recipe to make vegan jalapeno fritters stuffed with spiced and tangy potato filling. They are perfect to be served as an appetizer or as an evening tea time snack. Combine chickpea flour with carom seeds in a mixing bowl, season with salt to taste and pour in ¼ cup or more of water while stirring constantly. Pour only required amount of water to make a thick batter but should thin enough to be of pouring consistency. Add mashed potatoes and chopped fresh green coriander into another mixing bowl and season with all of spices. Mix well until well combined and evenly seasoned. Make a slit on a side of each jalapeno, lengthwise. Remove membrane and seeds. Stuff with prepared filling and keep ready on a tray. Put a wok or skillet over medium heat. 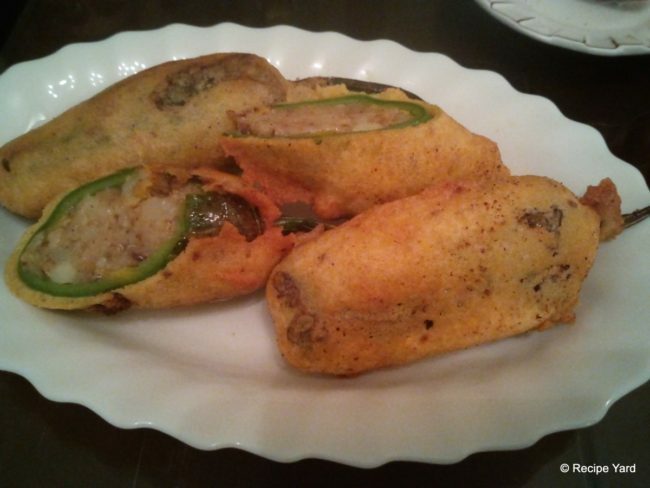 Dip one stuffed jalapeno in prepared batter so as to coat evenly on all sides and gently drop into hot oil. Repeat the process to drop all batter coated jalapenos into hot oil. Fry for 4 – 6 minutes or until golden brown while rotating the fritters using perforated spatula. Drain out fried fritters and place on a paper towel lined plate or tray so as to soak out excessive oil. Serve hot fritters accompanied with tomato ketchup or any other sauce of choice.